I have tried everything. 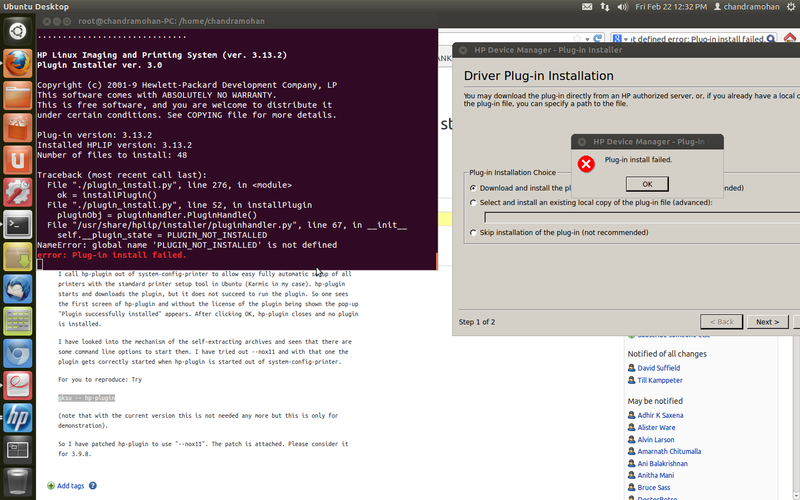 But the plugin does not seem to get installed on UBUNTU 12.04 LTS. I have tried "gksu -- hplip-plugin" command and have attached teh error message with this complaint. Kindly help me. I have spent 2 days on this matter to no avail. --> if problem still persists, please provide us above step 3) log and attach "/usr/share/hplip/base/codes.py" and "/usr/share/hplip/installer/pluginhandler.py" files. Hello Amaranth Thanks for the reply. 2. 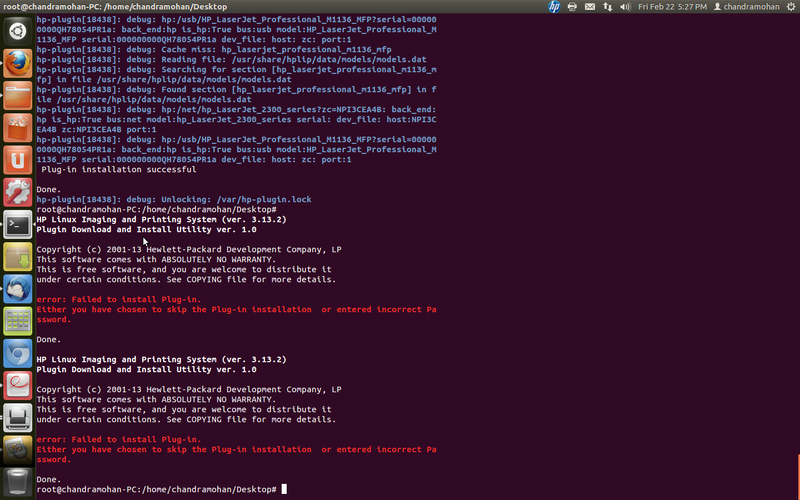 When I ran "sh hplip-3.13.2.run" command everything went smoothly till I saw the message seen in screenshot 1 appeared. When I clicked OK, the installation stopped at that point. 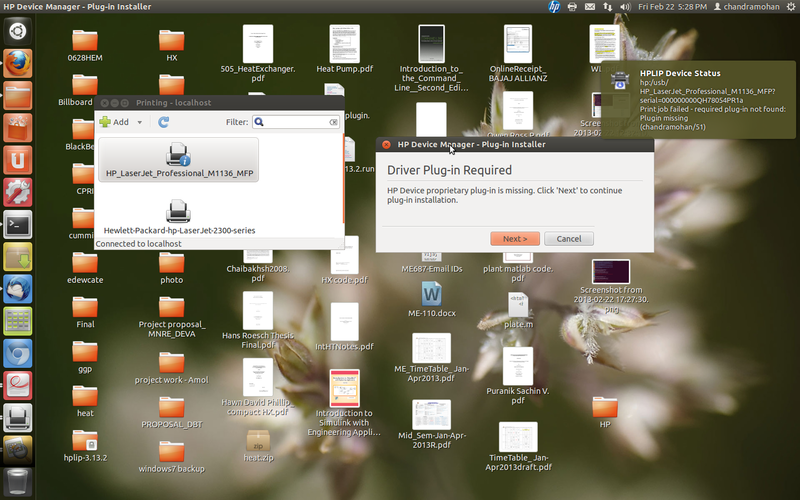 However, when I ran "sudo hp-plugin -g" command after that, surprisingly plug-in got installed as seen in screenshot 2. I don't know why it didnt work before. I had tried these steps before as well. 3. However, When I try to print a page I get message as seen in screenshot 3 attached. 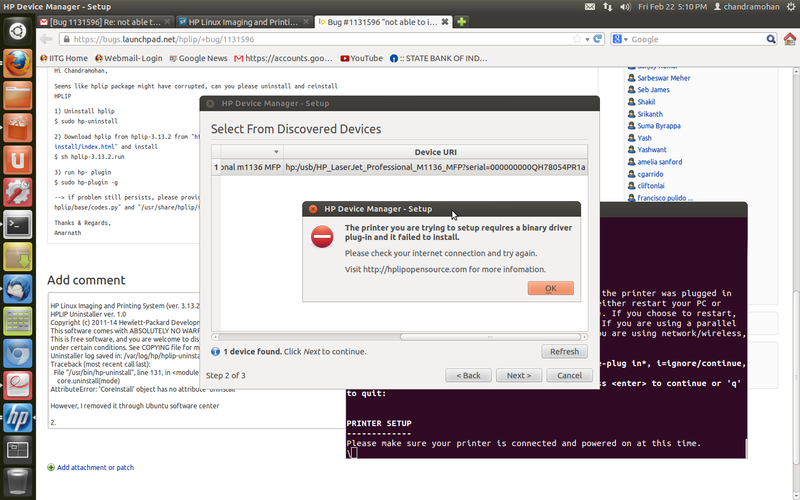 Also teh error message can be seen in text marked in red in screenshot 2 as well. Above files looks fine. From above screen shots, giving plugin missing message even after plugin installed successfully. Can please provide some more information to analyse further. > Above files looks fine. From above screen shots, giving plugin missing message even after plugin installed successfully. > Can please provide some more information to analyse further. > have spent 2 days on this matter to no avail. kindly find the log files attached hertwewith. Thank you for sending the logs. This issue is due to "/var/lib/hp/hplip.state" file doesn't have read permission to user. Please let us know what are the permissions of "/var/lib/hp/hplip.state" file? We look into this issue and fix it for next build. Thanks a lot. You guys are doing a great job out there...Keep up the good work. here. Are they going to face same issue if they have Ubuntu 12.04 LTS? If yes, I will inform them about this fix as well. No..there is no issues with Ubuntu 12.04. You can go ahead. Changing the bug status to "Invalid" as there is no actual code change done in HPLIP.